This is a bit of an odd-ball post. The semester is ramping up so I will be sharing some of the work I'm doing. My classes this spring: Tailoring II. We make the coat to go with our vest and trousers. Culture, Gender, and Appearance - this is really Fashion/Costume History. It's over in the the Textiles/Fashion Department. Technical Production - this is a credit that I receive for working on a show-related costume. This semester I'm draping a costume for a dance piece called "Corner." The unique challange in this will be fitting one costume on four different dancers - with different shaped bodies. The class that will explain the first and second photos in this post is Wig Making. For years I've had cast members asking me, "What is my hair going to be like?" My internal response always being, "I don't do hair - and I don't care!" That response came from my lack of experience more than dislike. Our first assignment in wigs is practicing the technique of venhilating hair into wig lace. It's similar to crochet or latch hooking rugs, so it's an easy crossover for me. These are four one inch squares of different types of hair and wig lace. Aren't they totally creepy?!!! And finally...knitting content. 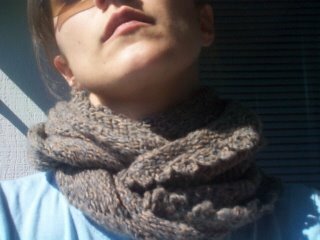 This is a scarf I made while cooped up during the infamous Ice Storm 2007! It is some Wool in the Woods boucle that I picked up at a shop in Oak Park, IL when it was closing (so sad). I alternated some other stash yarns into it so that I could maximize the yardage. I knit a bias garter stitch with something like 26 sts, and ended it with some crocheted loops of varying lengths. I also edged it with a double crochet once around. The hat is Grumperina's Odessa pattern which you can find for free over on MagKnits. It knits up from one ball of Rowen Cashsoft DK and is an easy, fast knit. Okay, can anyone that has switched over to the new blogger tell me why my vertical shots won't download to blogger vertical? Or let me edit them once they are downloaded? If you shed some light I'd appreciate it. However, I'm thinking of switching to a different blog host. As an example, in case you smoke ten smoking, [url=http://bwcreams.com]skin care products[/url] anti aging substances, but people find out about it. best wrinkle cream Pregnant with her boy, she obtained 60 kilos and has http://bwcreams.com he stocks that they function.